WASHINGTON - Veterans with amyotrophic lateral sclerosis (ALS) may receive badly-needed support for themselves and their families after the Department of Veterans Affairs (VA) announced today that ALS will become a presumptively compensable illness for all veterans with 90 days or more of continuously active service in the military. "Veterans are developing ALS in rates higher than the general population, and it was appropriate to take action," Secretary of Veterans Affairs Dr. James B. Peake said. Secretary Peake based his decision primarily on a November 2006 report by the National Academy of Sciences' Institute of Medicine (IOM) on the association between active-duty service and ALS. "We are extremely grateful to Secretary Peake, Congressman Henry Brown and Senator Lindsey Graham for standing on the side of veterans with ALS across the country," said Gary Leo, president and CEO of The ALS Association. "Thanks to their leadership, veterans with ALS will receive the benefits and care they need, when they need them. Thanks to their efforts, no veteran with ALS will ever be left behind." The report, titled Amyotrophic Lateral Sclerosis in Veterans: Review of the Scientific Literature, analyzed numerous previous studies on the issue and concluded that "there is limited and suggestive evidence of an association between military service and later development of ALS." "ALS is a disease that progresses rapidly, once it is diagnosed," the Secretary explained. "There simply isn't time to develop the evidence needed to support compensation claims before many veterans become seriously ill. My decision will make those claims much easier to process, and for them and their families to receive the compensation they have earned through their service to our nation." 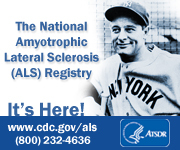 ALS, also called Lou Gehrig's disease, is a neuromuscular disease that affects about 20,000 to 30,000 people of all races and ethnicities in the United States, is often relentlessly progressive, and is almost always fatal. For more information, to to page 5 of the The May VA Newsletter. For more information on VA's disability compensation program, go to www.va.gov or contact 1-800-827-1000. To be connected with a PVA Service Officer in Michigan, contact Michigan Paralyzed Veterans of America at 248-476-9000.